Its simply textures - good looking ones on my view. Works nicely for SSE too. Thank you! I really like this mod. Could you make it available for console players on Bethesda.net? For NMM users as a heads up make sure you either install this manually or create a fomod to get this to function properly. I can't believe I forgot to endorse this! This is probably my favorite eye for khajiit. No problems so far and I think they look great on all of the khajiit in game, not just my own. 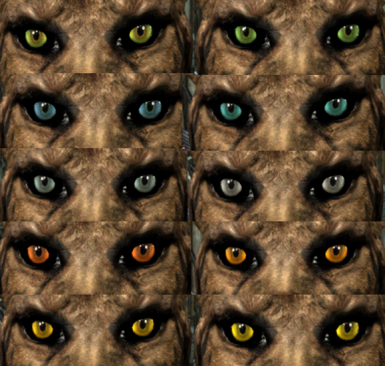 As I post this I'm experimenting trying to make it so that my khajiit has her same eyes from this mod as her vampire eyes; she has those darker blue ones and I love how they look on her. I'll try to remember to grab a screenshot. I installed the mod,just to have black marble eyes..anyone know what's wrong? this makes nexus mod manager display this as an older version, and needs to update so I'm wondering where is the discrepancy here. yes It does. glowing eyes has reedited mesh only, my mod retextures vanilla eyes. This mod is great already, but I'd absolutely LOVE you if you added heterochromia! EDIT: Also, is this compatible with the glowing eyes mod? Wasn't sure if I would like this mod, but I actually spent a good 15 minutes debating on a color to pick! I'm glad the pupils aren't really thin, since my Dar'Raanji looks menacing enough as it is! Great mod, Endorsed, thank you! I also added an image, or tried to.